Download "FINANCIAL AND ADMINISTRATIVE POLICY PERSONAL SERVICES PAYMENTS (F31) ATTACHMENT 8"
1 FINANCIAL AND ADMINISTRATIVE POLICY PERSONAL SERVICES PAYMENTS (F31) ATTACHMENT 8 FOREIGN NATIONALS IN NONIMMIGRANT VISA CLASSIFICATIONS WHO MAY BE LAWFULLY EMPLOYED &/OR STUDY IN THE U.S. WITH CERTAIN RESTRICTIONS Type of Visa/Description Study Restrictions Employment Restrictions A-1/ Foreign Diplomatic Personnel A-2 Individuals in the U.S. as employees of a foreign government, e.g., ambassador, minister, diplomat, or consular officer. 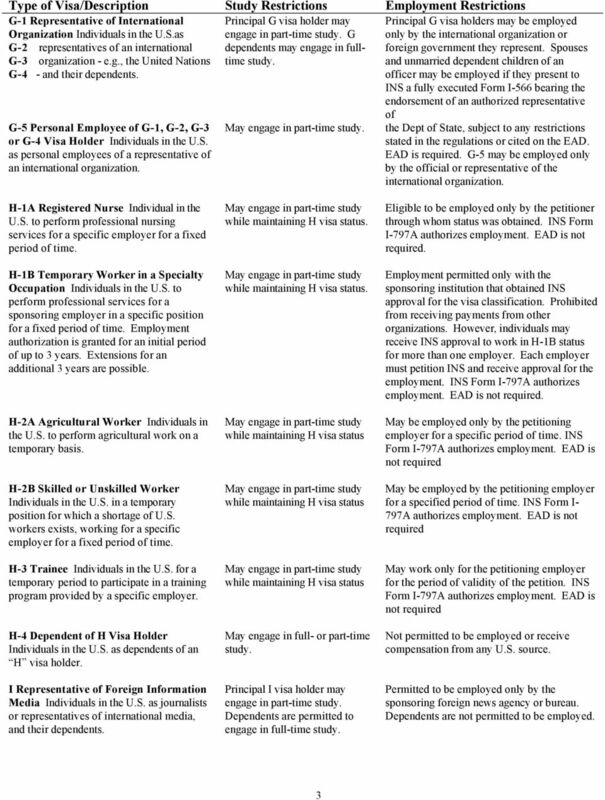 May engage in incidental Principal A-1/A-2 visa holder may be employed only by foreign government entity. Dependent of A-1/A-2 Visa Holder Immediate family members of foreign government officials. (Dependents also carry A-1/A-2 status.) A-3 Employe of Foreign Government Official Attendants or other personal employees of foreign government officials. May engage in full-time May engage in incidental Spouses and unmarried dependent children of a foreign government official may be employed if they present to INS a fully executed Form I-566 bearing the endorsement of an authorized representative of the Dept. of State, subject to any restrictions stated in the regulations or cited on the EAD. EAD is May be employed only by foreign government entity. B-1 Visitor for Business Individuals in the U.S. for a short time to engage in business activities such as consulting with business associates, attending professional conferences, or conducting independent research. 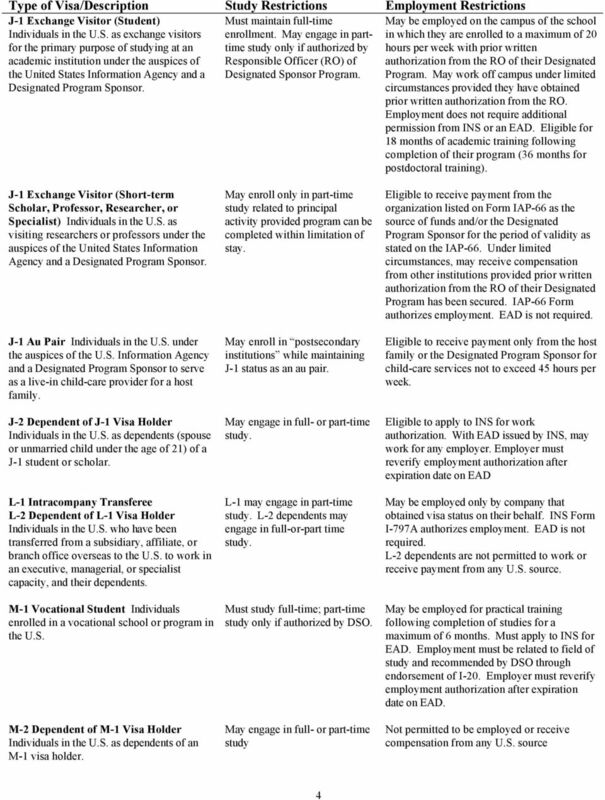 May not engage in any employment in the U.S., including salaried work, or services performed on an independent basis. May engage in incidental Foreign visitors present in the U.S. on a B-1 visa may not be paid any salary, wage, honorarium, stipend, or other form of compensation for services rendered from a U.S. source. Only reasonable reimbursement for incidental expensesincluding accommodations, meals, and travel expenses-may be paid. B-2 Visitor for Tourism Individuals in the U.S. for travel, tourism, or recreation. 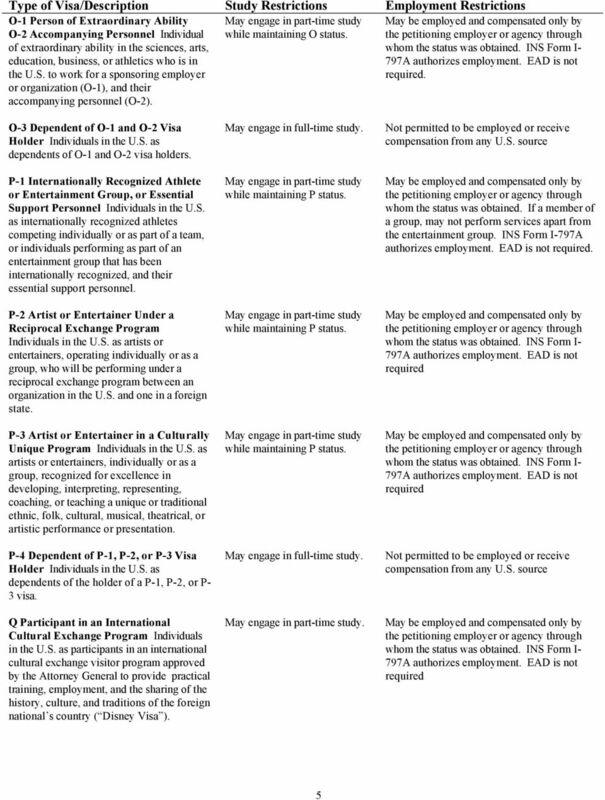 B-2 Prospective Student or Prospective Scholar Individuals who enter the U.S. indicating a clear intent to study here or to change to a J-1 Exchange Visitor Status. Consulate notation on visa page indicates Prospective status. Individual must apply for a change of status before the expiration date on the I-94. Visa Waiver for Business (VWB) and Tourism (VWT) Individuals permitted to enter the U.S. without a visa for a stay limited to 90 days. Available only to citizens of countries designated by the U.S.State Dept. incidental to visit - e.g., may enroll in short-term English language courses as long as the course of study is under 18 hours per week (part-time) and of short duration. May engage in full-time study but must apply for change of status to F-1 or J-1 immediately after entry. Full-time study is permitted while change of status is pending. 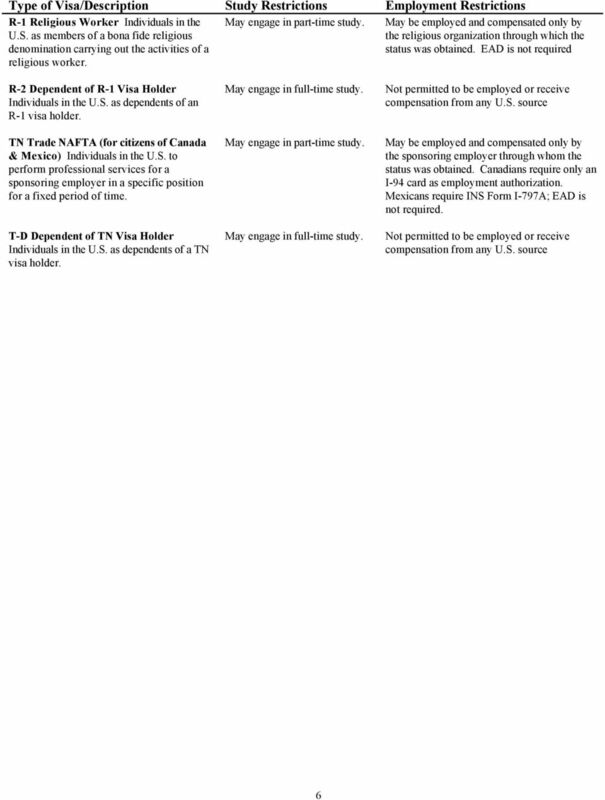 See B-1/B-2 visa. Foreign visitors in the U.S. on a B-2 visa are prohibited from receiving payments of any kind from any U.S. source. Reimbursement of expenses is prohibited. Prohibited from receiving payments of any kind from any U.S. source. 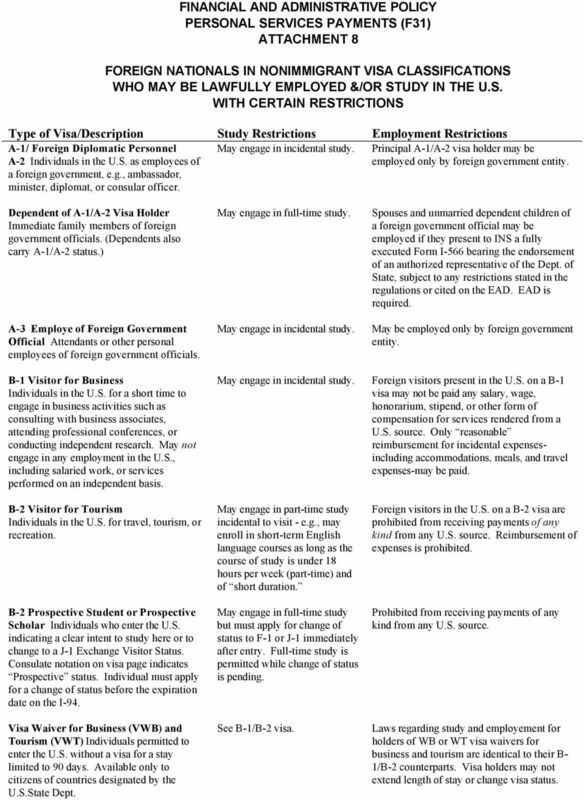 Laws regarding study and employement for holders of WB or WT visa waivers for business and tourism are identical to their B- 1/B-2 counterparts. Visa holders may not extend length of stay or change visa status.